In this super easy and flavorful side dish, green beans are quickly seared in a hot skillet. Adding fresh lemon juice and salty cotija cheese brings these humble vegetables to the next level. A few months ago I traveled with my husband and stepdaughter to Miami. We treated ourselves to dinner at Yardbird, an amazing restaurant that serves up Southern-style comfort food. One of the sides we enjoyed was blackened okra with cotija cheese. It was absolutely delicious, and I knew I wanted to recreate something similar in my home kitchen. My local market was out of okra during the week I was testing this, so I opted for green beans instead. The result is absolutely addicting… we can’t stop eating this side dish! 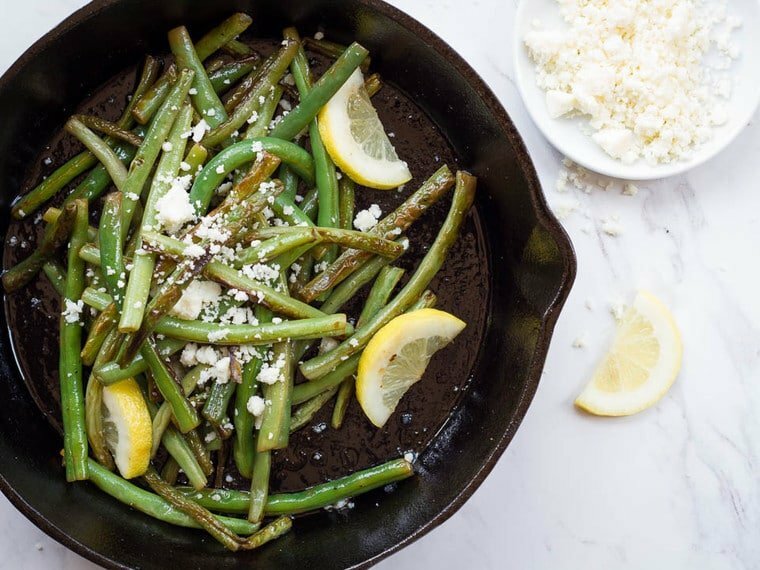 The French were the first to put green beans on restaurant menus. At first, Spaniards were not taken by them at first and found their texture to be too tough (obviously they hadn’t perfected their skillet searing technique!). They were used mostly as ornamental plants until, according to an old wive’s tale, a few pods fell into a pot of soup without being noticed by the cook until it was too late. Instead of starting a new pot, he served the soup with the green beans, then realized all he was missing. 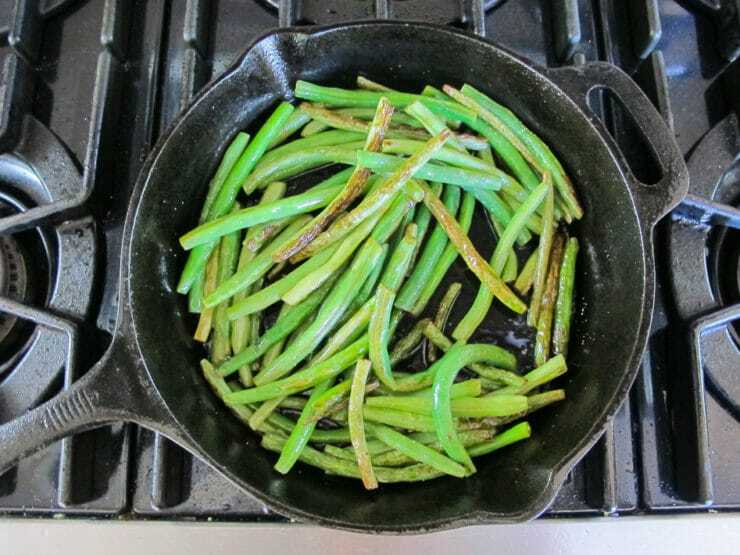 I give the green beans a light steam before searing them, then finish them in the cast iron skillet for that flavorful seared finish. Cast iron is the only way to go here; you need to get your skillet really hot before starting, and a seasoned cast iron is the best for this sort of thing. Searing the green beans will make your kitchen a bit smoky, so be sure to open a window or use your stove’s ventilation system. The flavor result is so worth it. A squeeze of fresh lemon juice at the end brightens the dish. 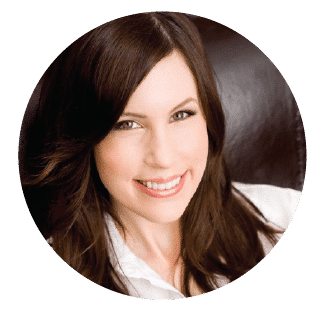 If you want to make this dairy free, it’s quite tasty even without the cotija cheese. You can whip this up in just a few minutes and feel like a rock star chef. Enjoy! 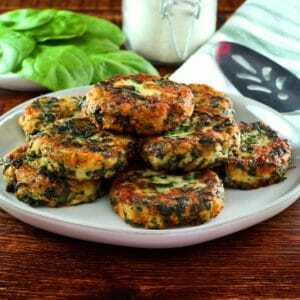 Easy flavorful vegetable side dish recipe. 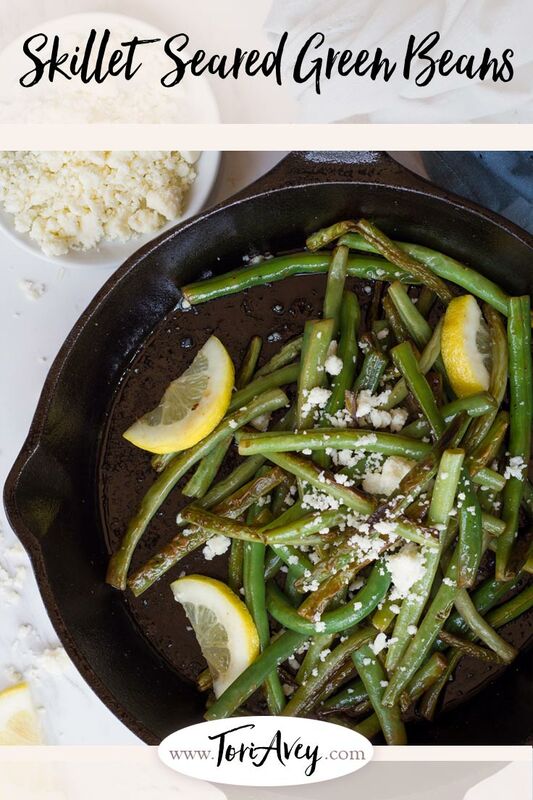 A quick hot sear adds major depth of flavor to green beans. Simple and addicting! 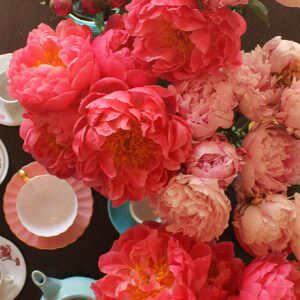 Pour about 1 inch of water in the bottom of a medium pot and bring to a boil. Add the green beans and cover the pot. 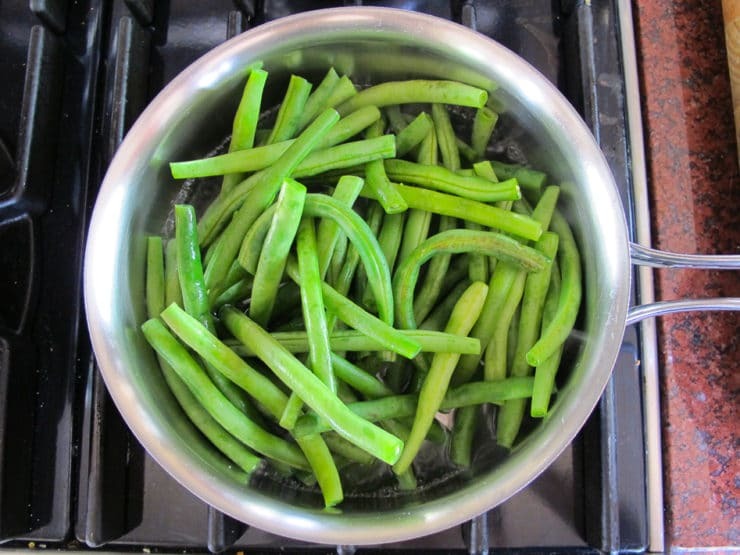 Steam the green beans for 3-5 minutes until bright green and tender-crisp. 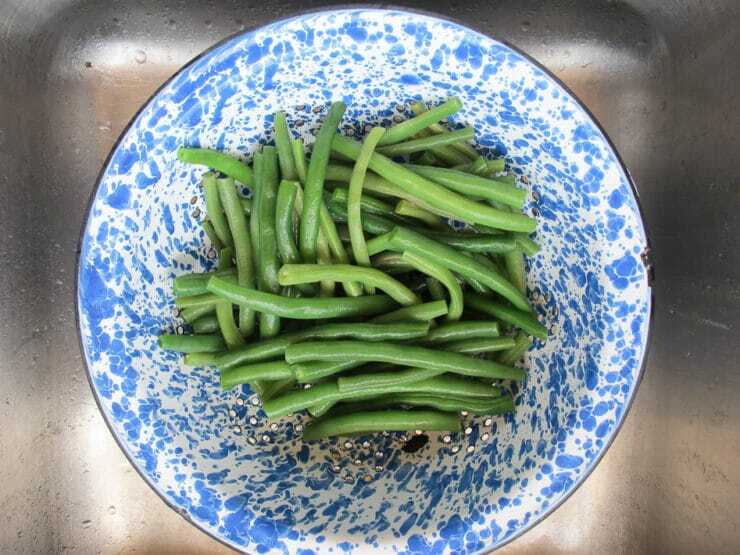 Drain the green beans and rinse them with cold water to stop the cooking process, then shake in the colander to drain completely. Spread the beans out on a kitchen towel to get rid of excess moisture. These steps can be done 1-2 hours ahead. The rest of the cooking should be done just before serving. For this next part, turn on the vent or open the windows, it will get smoky! Heat a cast iron skillet over medium high for a few minutes to get it very hot. Pour in the olive oil; it will begin to smoke slightly. 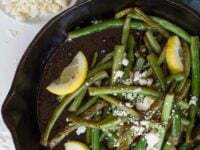 Quickly add the drained green beans to the skillet and turn the heat to high. Sear the green beans for 2-3 minutes, stirring occasionally, until the beans have color and are slightly blackened in places. Remove from heat. Sprinkle the beans with fresh lemon juice, then add salt and pepper to taste. Place the beans on a serving plate and sprinkle with crumbled cotija cheese. Serve warm. I liked this recipe a lot, except for the green beans which cooked up kind of tough. Maybe it’s because I used older bigger beans. Will try it again with younger smaller beans, since the flavor was excellent overall. I have a similar recipe that I have been making for as long as I remember. I sear the beans on my iron cast pan with a little bit of sesame oil. When they are nice and ready I add a sprinkling of salt and pepper and a sprinkling of toasted sesame seeds. Great recipe. I added garlic powder, onion powder and rosemary. It gives more flavor and makes it more tasty.